How low will they go. Not much lower, but the upside potential on home mortgage rates in Los Angeles is huge. 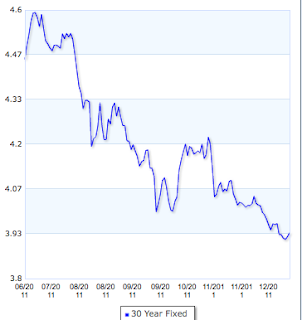 First let's look at a 5 year chart so you can get some perspective on how low rates ar now. 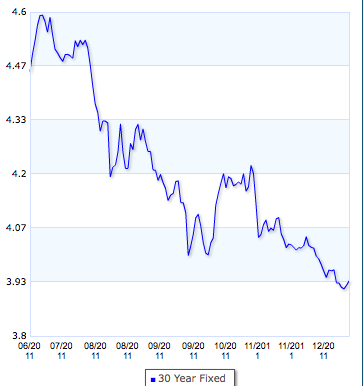 Then let's look at the 6 month chart to see the unbelievable short term fall in mortgage rates this year! Now, any smart statistician will tell you that when you see this kind of drop, there is far more upside potential than down. To be clear, there are some who say that if the Fed does another huge stimulus, we could see some additional downside. 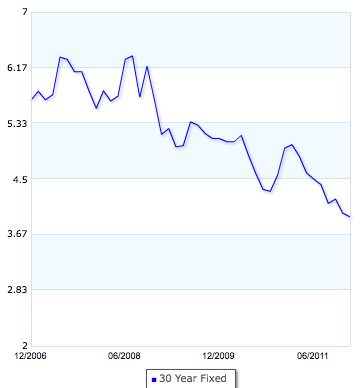 However, going back to 4.5% or even 5% is far more statistically likely than a drop to 3.5%. As of a little while ago on December 22, 2011, the quoted national average rates were these. Lowest Mortgage Rates Ever - What Should You Do?